In a food processor or blender, combine all vinaigrette ingredients except oil. Blend on medium-high speed and add the oil slowly in a stream. Continue mixing for a few seconds more to allow the vinaigrette to emulsify. Add salt and pepper to taste and adjust sweetness with the honey. Serve with the following salad. Makes about 1 cup. 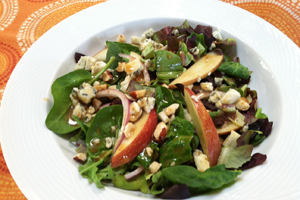 In a large mixing bowl combine the spinach, arugula, Belgian endive, red onion rings and red apple wedges. Drizzle with enough dressing to lightly coat the greens and apples. Toss well and arrange a good handful on each of four salad plates. Top with the bleu cheese crumbles and the candied walnuts. Add additional dressing as needed. Serves 4 to 6.